As Christmas is coming up it’s always nice to have a hearty tasty snack up your sleeve should you get any visitors. These are incredibly easy but have a huge load of flavour. I’ve added chilli, caramelised onions and a smidgen of Marmite (add some Worcester sauce instead of Marmite if you’re a hater. 1 egg beaten for egg wash.
1. Let the pastry get to room temperature. 2. Heat the oven to 180 degrees C.
3. Dice the onion, chilli and Thyme. 4. Heat some oil in a small frying pan. 5. Add the onion and sprinkle with the Paprika some salt and pepper and the sugar. 6. Once the onion has softened add the chilli and Thyme. 7. One the sugar has started to melt nicely add the balsamic vinegar and let the liquid reduce. 9. Once cooled place the onion mix into a large bowl and add the sausage meat and Marmite. 10. Lay out the puff pastry sheet, roll it out so its thinner and you can cut it in half lengthways into 2 rectangles so you’ll have enough to wrap up 1 length of sausage meat each rectangle. 11. Roll the meat mixture into a long sausage shape with a diameter of around about an inch. 12. Place the sausage shape onto the pastry along one end of a long side of the pastry and simply roll the pastry over tightly and press with your fingers to seal. 13. 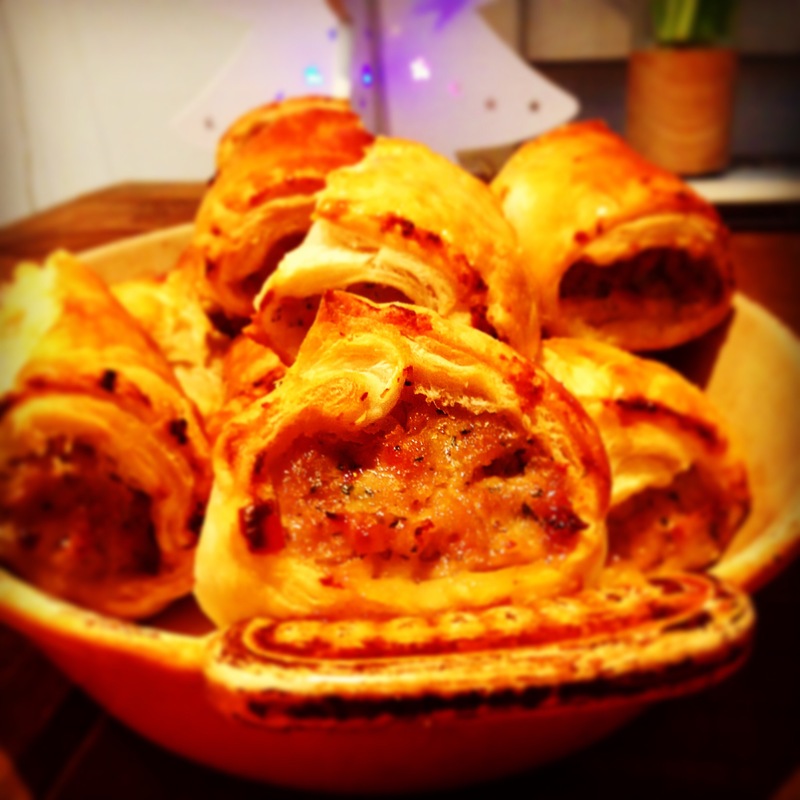 Take a sharp knife and cut the large sausage rolls into individual sausage rolls of your choice of length. I normally get around 20 out of 2 sheets of pastry. 14. Place some baking paper onto a baking tray and lightly grease. 15. Place your sausage rolls onto the baking tray and egg wash them all. 16. Place into the heated oven for around 15 to 20 minutes or when the pastry is nice and golden.